I am starting to assemble the back but this is the front so far. Some people wanted to see. You can count the squares. I am making the back of plain squares and haven’t yet decided about the sleeves. I think they’ll be textured, maybe, but of one pattern. Maybe. 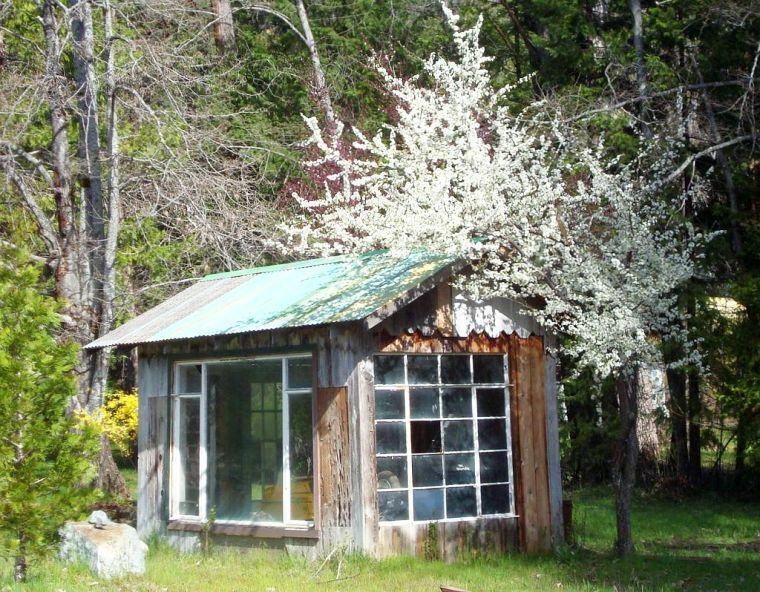 Here’s the old garden shed and as rickety as it is, it is still lovely surrounded by bloom. The white and purple plum trees and the yellow forsythia. Even the barely budded tree leaves add some color to the spring palette. You have to watch where you step these days, too as some springtime treasures are harder to spot. Check the header above! We are starting to look to gardening season, I’ve planted some of the cole family in the new beds already and have warmer weather things waiting indoors. 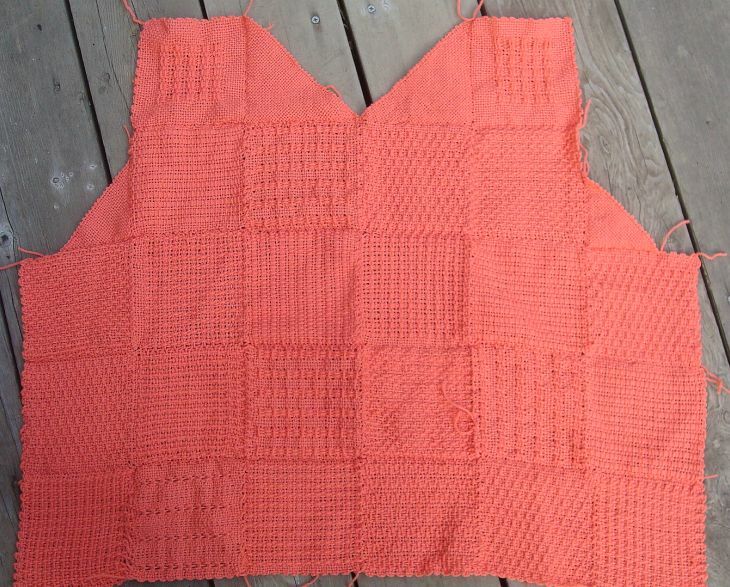 Also still weaving on my orange top and making good progress. Should be able to post progress pictures here for that in a couple days. And COMING SOON! a new Hazel Rose Loom for your enjoyment! Just a hint to keep you in suspense! This is what happens when I don’t get the bed made early! It was raining out and she loves my pillow. 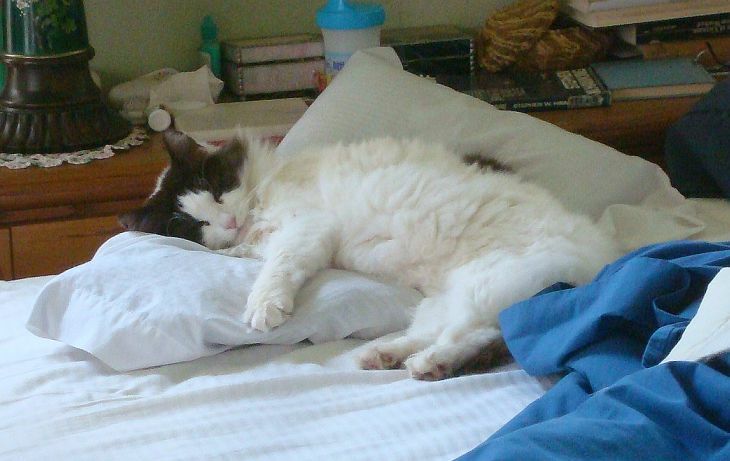 Well, the sheets were due to be changed, anyway. Hope your Easter was, cozy and warm! A project for a Green Spring. 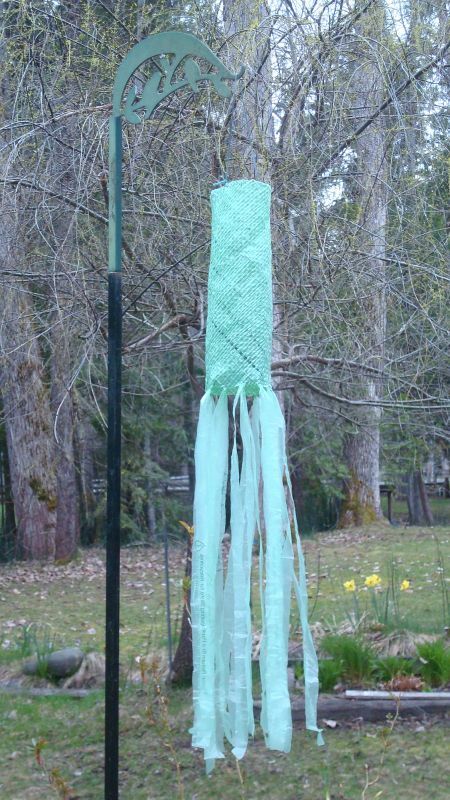 A friend who was moving gave Randy one of those rainbow colored nylon wind socks and, looking at it, I thought, “Well now, Hazel, I think you can make one of those easy with your 12″ square loom!” and I was right. I only had a stock of the green grocery bags so it isn’t as colorful as you could make it with bright colored bags. I’m sure you have some of these saved. 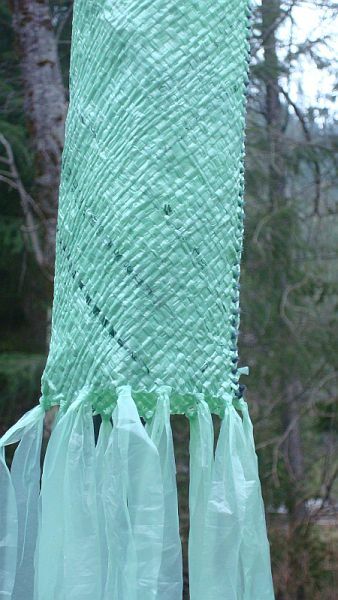 It took two bags to weave the square and part of another one to make the streamers. Here’s a link on how to cut your bags into one long strip, no fooling around with loops. How to cut your plarn in a long strip. Once I cut my plarn, I just butterflied it and dropped it on the floor and wove from there. Weave your square. I used a bit of sock yarn to sew it into a tube, leaving a tail about a foot long which I then knotted to the opposite side of the tube. I used an overhand stitch and did not pull it tight so that I could pull the seam to lay flat. It is just stiff enough to hold it’s tube shape but if yours doesn’t you could use a bit of wire or stiff plastic around the mouth to hold it in a circle. I leave that up to you. I cut loops from another bag and used a larks head to tie them onto the bottom edge about every 4th loop. Then cut the loop to make two tails. That’s it. Hang it out and enjoy the gentle waving in the breeze. But we do have one great project going. The new planter boxes around the deck! 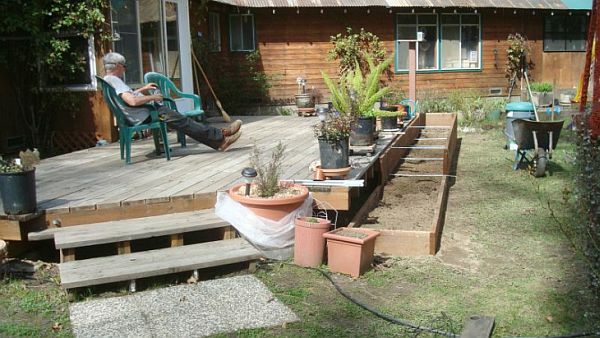 Randy has been working hard to get this done in time to start planting for this years garden. I have already planted peas and chard. Here he is taking a well earned break. Good thing we have years of compost to use to fill them. But I am nearly though with a couple of projects, too, which I hope to be able to show you very soon. Meantime, I hope your spring is becoming warm and sunny, too! It’s Really spring now! Warm, sunny, things starting to grow, birds carrying sticks, my birthday! The gal friends gave me a party, it was great fun to see everyone after being holed up all winter. We were all suffering from ‘cabin fever’. 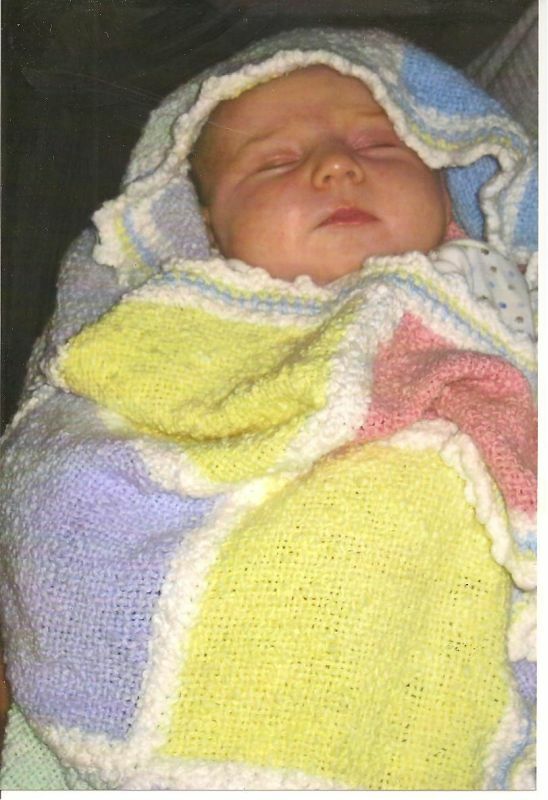 And little Ellie Petunia’s mom brought me a picture of her sweet self wrapped in the blanket I made for her on the 6 inch Multi loom. It’s some nice Green Mountain Spinnery cotton and Mom says it gets softer all the time. Ellie is 6 months now and sat smiling and talking to us, such a good baby! I was happy to see the blanket in use, of course!